(but this link seems not to work: http://dx.doi.org/10.1002/9780470015902.a0002014.pub2 Nov 2012). Intranet: http://www.le.ac.uk/biology/phh4/HHpubs/ELS_PlantGenomes_SchmidtHH.pdf due Nov 2012). The plant nuclear genome consists of DNA divided among the chromosomes within the cell nucleus. Plant genomes contain coding and regulatory sequences for genes and repetitive DNA. They are evolutionarily dynamic and analysis provides insights into the evolution of genes and genomes, supporting studies of species phylogeny and plant breeding. The amount of DNA present in plant genomes, nearly constant within one species, varies over some 2300 times between species; the majority of the difference is accounted for genome duplication, or by various classes of repetitive DNA which may be dispersed widely along chromosomes or located in arrays at a small number of loci. Bioinformatics and genome sequence analysis show conservation of many gene sequences across all plants. Repetitive DNA motifs may be conserved over large taxonomic groupings or evolve rapidly. Repetitive DNA plays an important role as a structural component of plant chromosomes (e.g. telomeres and centromeres) and affects gene regulation. Plant nuclear genome sizes, constant in a species, vary in size from 60,000,000 base pairs of DNA (written as 60 Mbp) to 150,000 Mbp, a range of 2300 times. The DNA of plant nuclear genomes is wrapped around the histone proteins to form nucleosomes, and the resulting chromatin is organized into linear chromosomes with characteristic numbers, sizes and morphology in each species. 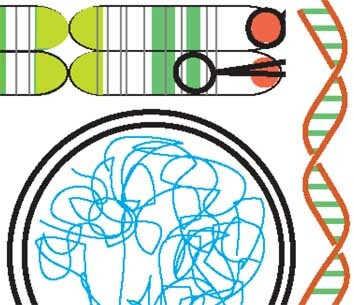 Genomes contain coding sequences, typically for 25,000 to 40,000 genes, and regulatory sequences, as shown by genome sequencing and bioinformatics. Size variation comes from polyploidization, genome or chromosome duplication, and particularly amplification of DNA motifs to give repetitive DNA. Some repetitive DNA encodes genes, in particular the 45S and the 5S ribosomal RNA genes (rDNA); other repetitive DNA has structural roles at the telomeres or chromosomal ends and the centromeres where chromosomes attach to microtubules during segregation. In most species, much of the repetitive DNA has no known function. This entry was posted in Publications and tagged botany, chromosomes, crops, encyclopedia, genomes, heterochromatin, in situ hybridization, junk DNA, microsatellites, nucleus, repeats, repetitive DNA, retrotransposons, satellite, satellites, tandem, tandemly repeated DNA, teaching, transposable elements. Bookmark the permalink.